Tonali's Meats are proud to be serving some of the finest restaurants in the state of Colorado. Over the past 54 years they have expanded their product line significantly (about 10 fold) and are now located right in the heart of Denver. 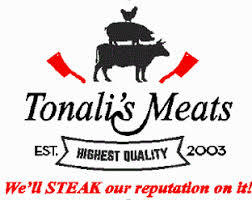 Tonali's Meats actually began as Snooky's Market, a small grocery store, in 1963. They changed names over the years, Cash and Carry Meats, Century Meat Packers, and now Tonali’s Meats. Regardless of the name change, they are still the same family serving restaurants all across Colorado. Tonali's Meats strives for perfect customer service, as does Ad Hominem, and their pride in their product and the city of Denver is apparent. We love working with such a passionate company, and hope that it shows by the food on your plate!